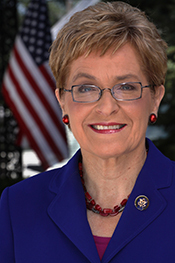 KAPTUR, Marcia Carolyn (Marcy), a Representative from Ohio; born in Toledo, Lucas County, Ohio, June 17, 1946; graduated from St. Ursula Academy, Toledo, Ohio, 1964; B.A., University of Wisconsin, Madison, Wis., 1968; M.A., University of Michigan, Ann Arbor, Mich., 1974; attended the University of Manchester, Manchester, England, 1974; post-graduate studies, Massachusetts Institute of Technology, Cambridge, Mass., 1981; urban planner, Toledo-Lucas County, Ohio, Plan Commissions, 1969-1975; director of planning, National Center for Urban Ethnic Affairs, 1975-1977; assistant director for urban affairs, domestic policy staff, Executive Office of the President, 1977-1979; elected as a Democrat to the Ninety-eighth and to the eighteen succeeding Congresses (January 3, 1983-present). Papers: In the papers of Jane R. Gust, 1945-1983. Marcy Kaptur is the subject of a taped interivew with Jane Gust. Political Commercials: Collection includes 90,000 political advertisements. Collection includes 45 television campaign ads of Marcy Kaptur. Kaptur, Marcy. Women of Congress: A Twentieth Century Odyssey. Washington: Congressional Quarterly, 1996. "Marcia C. 'Marcy' Kaptur" in Women in Congress, 1917-2006. Prepared under the direction of the Committee on House Administration by the Office of History & Preservation, U.S. House of Representatives. Washington: Government Printing Office, 2006.